The SignWriting Script is written by hand. It always has been, from the beginning and still today. A founding principal of the SignWriting Script is that signs are written in 2-dimensional signboxes. The size of the signbox varies with the symbols written inside. Both block printing and handwriting use 2-dimensional logograms. Inside of a 2-dimensional signbox, the iconic symbols are placed in a freeform, 2-dimensional arrangement. This feature of the script expresses spatial relation directly. Block printing is only half of the SignWriting Script. Block printing is based on the iconic symbols of the symbol set. Each of the iconic symbols is structured, standardized, and highly featural. Block printing is used in education, publishing, and is the basis of the computerized model. SignWriting Printing is easy to read. It is designed for the reader. The Printing can be written by hand as well as by computer. If I am writing a letter to a friend in ASL, I write the letter in SignWriting Printing, taking the time to make sure that my handwritten-symbols are easy and clear to read. I try to write as clearly as if I were using a computer. Of course it is slower, but it is worth it, knowing that my friend will be able to read my letter! 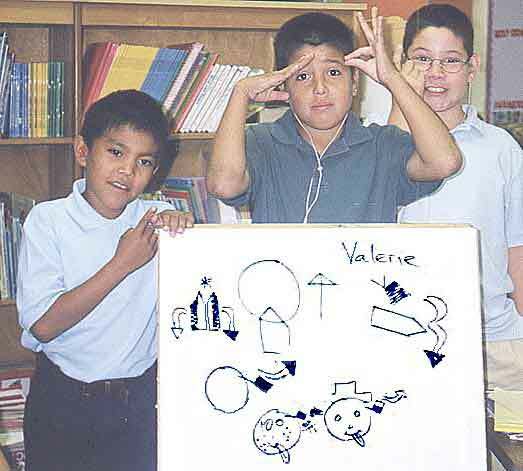 Kids all over the earth are learning block printing thanks to Valerie Sutton and the material she donates though the Center for Sutton Movement Writing. 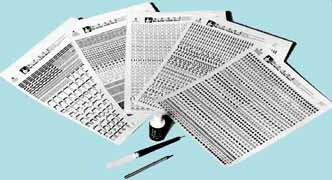 The history of SignWriting Publishing had a rapid development between 1981 and 1984 with The SignWriter Newspaper. Patience and concentration was needed to write neat enough for publication. Stencils and wax transfer symbols were used in painstaking work. Typesetters could consistently reproduce the iconic symbols. Discussions during early publishing history were a catalyst for developing a way to type signs. The SignWriter Newspaper suspended in 1984 and resumed publication as a typed SignWriter Newsletter in 1989. Block printing is the basis of the computerized SignWriting model. Read about the history of computerized SignWriting in draft-slevinski-signwriting-text-01. Computerized SignWriting is important, but there is so much more to the SignWriting Script. SignWriting Handwriting has always been a part of the script. SignWriting Handwriting is easier to write by hand, than the Printing. It is designed for the writer. There are several variations of Handwriting, and since most of the time, the writer is only writing for private notes, some writers create their own shortcuts that work just for them...and that is fine! A popular form of SignWriting is cursive. It can be shared among a groups of writers or it can be individualized and personal. Cursive writing is designed to have fluid marks and a natural flow. Cursive writing may use fewer features than the iconic symbols, but should be related to an iconic symbol in appearance and meaning. Once developed, this style of writing is great for taking notes in a class. Shorthand is a skill of the proficient writer. They can write SignWriting shorthand quickly and naturally. 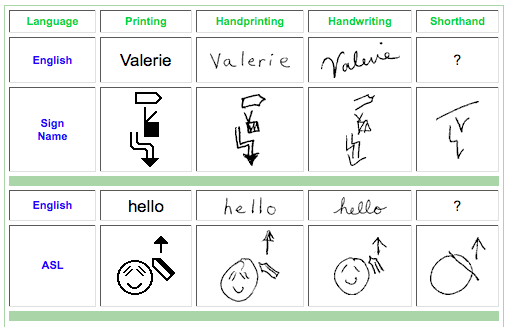 In 1982, Sign Language Stenographers could record sign language with SignWriting Shorthand at normal signing speed. Time tests proved practice and special training were required. The marks they write are personal style of quick and efficient strokes with a highly developed reception to what signifies meaning. They understand the iconic symbols of the SignWriting Script, but their marks are personal reminders rather than a fully developed text. The shorthand in and of itself is often an incomplete representation of the gestures that were experienced. 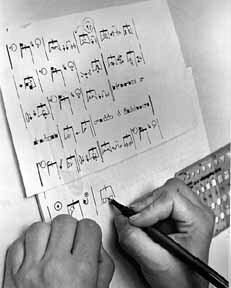 The shorthand writing can be thought of as a short-term memory device. Often shorthand notes must be revised and extended at a later time, the sooner the better. Online, we most often experience the block printing branch of SignWriting. I hope that we do not forget or loose sight of the handwriting branch. Faster typing online would mean an even smaller incentive to learn handwriting or improve our penmenship. There is a thriving handwriting community for SignWriting that exists throughout the world. They use SignWriting Handwriting on a daily basis as a natural part of their lives. Humans are creatures of language. A written form of language is a valuable tool. Leaning to draw is really a matter of learning to see - to see correctly - and that means a good deal more than merely looking with the eye. A majority of the indented and italicized sections below are excerpted from "The New Drawing on the Right Side of the Brain" by Betty Edwards. The book is worth the price for the appendix alone. Is Beautiful Handwriting a Lost Art? This is the name of the appendix to her book. She advocates learning to draw. Handwriting is a natural extension of drawing. Today, handwriting is no longer a subject of interest. Like the times tables, moral sayings, and polite manners at tea parties, handwriting - if it is thought of at all - is relegated to quaint customs of the past century. Yet, when I ask a group of people, "How many of you would like to improve your handwriting?" nearly all the hands go up. If I ask "Why?" the answers vary: "I want my handwriting to look better... to be more readable... to be good enough to be proud of." A beautiful introduction. While on the Internet, we focus on the computerized model, while writing with the hand, let us remember that handwriting is an art form. It involves the hand, eye, and mind. The practiced mark of a skilled writer is a beautiful thing. The writing is a fluid and natural expression of the writer. And yet I know that handwriting is important, and the group response I described above indicates that others feel that way too. In fact, of all the way we express ourselves nonverbally, none is quite so personal as our handwriting -- so personal and important that our signatures are legally protected as a mark of identity. Unlike other ways we use to express our individuality, we have sole ownership of our handwriting. It is a personal possession that no other person is allowed to use or imitate. In past centuries, handwriting was considered an art. Every school had its master of mistress of penmanship, and in the nineteenth century much time and attention was consumed in perfecting the extravagant looks and swirls of Copperplate script. In America in the early decades of this century, our schoolchildren assiduously studied the venerable Palmer method, derived from a beautiful Spencerian script. By the late 1930's, however, the Palmer method had given way to an unlovely manuscript called "ball-and-stick" lettering for very young children, with a shift from lettering to cursive, or "real," writing by around fourth grade. This shift was mainly a matter of making joining marks between the "ball-and-stick" letters. Responding to educational theories in the 1940's and 1950's about encouraging individuality and avoiding rote learning, teachers encouraged each child to use the style of writing that felt confortable, within the limits of legibility and correctness of letter forms. Children had a choice of size and slant of letters, sometimes even the choice of staying with printing, and teachers expected that each child's handwriting would more or less settle down to a legible form. Beauty was not an issue. Legibility was sufficient. But writing is an art form. Using line, one of the most basic elements of art, handwriting can function as a means of artistic self-expression. Like drawing, handwriting employs certain conventional forms that have agreed-upon meanings. Over centuries, the letters of the alphabet have evolved into shapes of great beauty communicate verbally, yet at the same time can convey subtle nonverbal intentions and reflections of the mind of the writer / artist. This is what we have lost. In my opinion, legibility is not enough. Educational theorists have sold handwriting short. Can we regain this lost art? I think we can, by linking writing once again to the esthetic purposes of drawing. There is little difference between making a drawing in line and "drawing" a signature, sentence, or paragraph. The purpose is the same: to convey information about the subject and to express the personality of the writer / artist. This nonverbal expression is subconsciously perceived and understood by the reader / viewer. Shado paintings (cursive calligraphy) are like pictures of the subconscious mind. They are not final statements, but rather instant snapshots of the personality at the time of writing. That personality can be developed and strengthened through Ki practice. On the other hand, careless calligraphy is also a form of practice, reinforcing bad habits and stunting the growth of the personality. While we may never attain the disciplined aesthetic of the Oriental mind, surely we can bring beauty back into handwriting -- not the ornate beauty of past centuries, but rather a modern beauty of ease, clarity, and coherence. I will recommend a few general principles and a few exercises, and I will hope against hope that you won't get that awful sinking feeling of boredom. I urge you, at least, to give the exercises a try. Once you have absorbed and practiced the basic fundamentals of beautiful handwriting, you will be free to develop your own style. As your handwriting changes to a more artistic style, you will find it interesting to observe the reactions these changes cause. I think you will be pleasantly surprised. I hope this brief review of the expressive qualities of handwriting is helpful and inspiring. I believe the Japanese are right in their insistence on the importance of nonverbal messages and in the conviction that the way we write affects our personalities. Making one's handwriting more beautiful may seem a very small way to increase the total amount of beauty in the world. But, still, the widest ocean is made up of very small drops of water. This is true for sign language handwriting as well. This page was last modified on 13 October 2012, at 16:36.